From 2015-2017 the Lorna Byrne Children’s Foundation funded Creative Arts Therapy for marginalised children from some of the most disadvantaged communities in Ireland who have suffered trauma from abuse, grief, loss, environmental, domestic violence and poverty with our charity partner Blue Box. This included individual and group therapy in ten schools around Limerick and on site at Blue Box for children aged between 3-18 years old. The therapy was provided by professionally qualified art, music and play therapists. 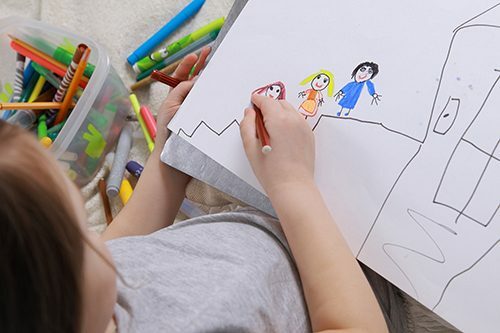 Children are referred to this service from individual schools, TUSLA – the Irish national child and family agency, community nurses, mental health providers and community organisations. We also supported a bespoke music therapy programme for children and parents that works to break the cycle of family abuse and trauma. It works to build healthy attachment between the parent and child.